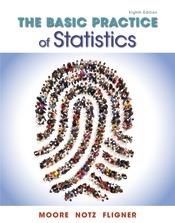 Written by an author team of accomplished leaders in statistics education, The Basic Practice of Statistics (BPS) reflects the actual practice of statistics, where data analysis and design of data production join with probability-based inference to form a coherent science of data. The authors’ ultimate goal is to equip students to carry out common statistical procedures and to follow statistical reasoning in their fields of study and in their future employment. The text’s long-standing renown is built on an inspired framework of balanced content, experience with data, and the importance of ideas. These themes are widely accepted by statisticians concerned about teaching and are directly connected to and reflected by the themes of the College Report of the Guidelines in Assessment and Instruction for Statistics Education (GAISE) Project. The eighth edition of The Basic Practice of Statistics is supported in SaplingPlus for a user experience of its own. SaplingPlus combines Macmillan’s StatTools, powerful multimedia resources, and text-specific exercises with the powerful targeted feedback of Sapling Learning, where every problem is a teaching and learning opportunity.